KNOXVILLE, TENN — Tennessee Lady Vols coach Pat Summitt finally reached the 1,000 victory mark in her storied career Thursday night, but still remains a staggering 734 victories shy of the beautiful, the fabulous, the incomparable Miss Elizabeth. Miss Elizabeth, the greatest female coach and manager in the history of sports, compiled a lifetime record of 1,734 victories and only 4 losses over a dazzling 15-year career, before sadly passing away in 2003. Her lifetime winning percentage of 99.8% is something that Summitt can only dream about, when she's not dreaming of Miss Elizabeth's impossibly suckable legs that is. 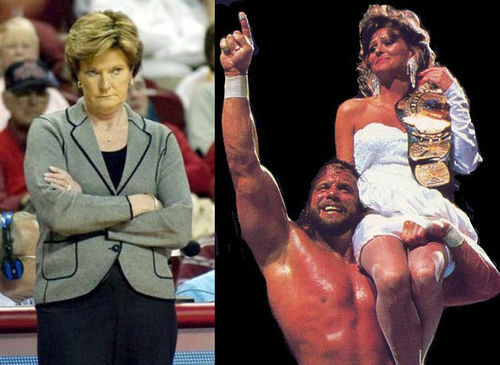 The stoic Summitt is clearly tired of living in Miss Elizabeth's shadow though, refusing to even answer reporters questions about the great Elizabeth. And it's hard to blame her as the comparison is an unfair one. Miss Elizabeth's tenure behind the turnbuckle showed every woman alive that you could be successful and ladylike. Summitt thinks she has her challenges against the likes of Auriemma? Try names like Hart, Fuji and "The Brain" Heenan. Elizabeth simply defined gorgeous power; the Helen of Troy of our time. Congratulations to Pat Summit.. Wow.. 1000 wins.. That?s really something.. That means she really is a good coach.. or maybe an excellent coach!! Glad to see someone mention this since the mainstream media won’t. is it just me or does miss elizabeth look just like marcy from ‘married with children’?